Blumental Clinic in Bratislava, Slovakia is a state-of-the-art facility offering specialist treatment for varicose veins and other venous conditions. Equipped with the latest technology and staffed by an expert team of surgeons, the clinic provides a wide range of walk-in, walk-out surgical and cosmetic procedures designed to restore legs to health and beauty. Blumental Clinic is Slovakia’s first specialist clinic for the treatment of varicose veins and other venous conditions, such as thread veins, spider veins and vascular ulcers. The modern clinic is equipped to the highest medical standards and boasts the latest state-of-the-art technology that allows for painless, walk-in, walk-out treatment. At Blumental Clinic, they are committed to providing high-level specialist care to meet the needs of each individual.Offering a humane, almost family-like approach that embraces a positive, can-do attitude and consistent communication, their top priority is always the total satisfaction of their clients. Pricing may vary depending on the nature of a problem and an exact, no obligation quote for treatment is always provided by the specialist at initial consultation. 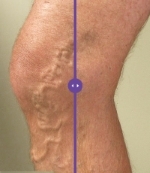 The specialist team at Blumental Clinic are trained in the latest techniques and technologies in the field of varicose vein surgery. Experienced, professional and experts in their field, they offer the highest quality services for clients with varicose veins problems. 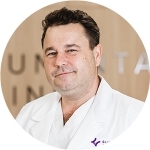 Dr. Kovacs is a renowned specialist in vascular surgery with 26 years’ experience. A graduate of Jessenius Faculty of Medicine, Martin campus of Comenius University in Bratislava, Dr. Kovacs completed his postgraduate surgical training at Slovak Medical University (SMU) in Bratislava and his specialist vascular surgery training at the Clinic of Vascular Surgery NUSCH (National Institute for Cardiac Diseases).As part of his postgraduate studies, he undertook an internship at the Clinic of Vascular Surgery at Semmelweis University in Budapest, Hungary, under leading vascular surgeon, Professor Csaba Dzsinich. He then completed his doctorate in surgery, for which he was awarded his PhD. Dr. Kovac was responsible for introducing carotid endarterectomy into common practice in county hospitals across Slovakia and carried out the first angioscopy in the country in 2006.He remains committed to staying abreast of the latest developments in the field of vascular surgery, most recently competing courses in aesthetic phlebology led by world renowned specialists, Dr. Dragica and Professor Dr. Kasuo Myiake. Dr. Kovacs is the author and co-author of 18 specialist publications and co-author of two book monographs. He is a member of the Minimally Invasive Surgery of Varices International Forum. Dr. Talapkova is an extensively qualified vascular surgeon with 11 years’ experience. Dr. Talapkova graduated with honours in general medicine from the Jessenius Faculty of Medicine, Martin campus of Comenius University in Bratislava, where she also undertook her surgical training. She undertook her postgraduate training in vascular surgery at Slovak Medical University (SMU) and the Clinic of Vascular Surgery NUSCH (National Institute for Cardiac Diseases) in Bratislava. She has completed a number of certified courses in the field of vascular surgery, as well as postgraduate studies both nationally and internationally. 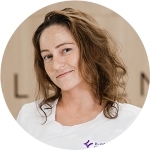 Dr. Bajuzikova is a general and vascular surgeon with 6 years’ experience. Dr. Bajuzikova graduated from Pavol Jozef Safarik University in Kosice. She completed her surgical postgraduate training at Slovak Medical University (SMU) in Bratislava, where she is currently undertaking further postgraduate study in the field of vascular surgery.She stays abreast of recent developments in the field of aesthetic phlebology, in 2016 completing two certified courses under Dr. Dragica, including one led by Professor Dr. Kasuo Myiake, and in 2018 completing an international workshop in aesthetic phlebology in Riga, Latvia at the Dr. Maurins’ Clinic. 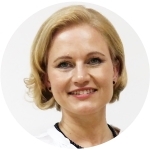 Dr. Bajuzikova is a member of the Minimally Invasive Surgery of Varices International Forum and a member of the Slovak Society of Vascular Surgery. Blumental Clinic provides fast and effective treatment of chronic venous disease, including varicose veins, spider veins, thread veins, vascular ulcers and symptoms such as heavy legs, itching and night time cramps, using Endovenous Laser Treatment (EVLT). Using LASOTRONIX SMART M laser technology, a special optical fibre is inserted into the vein that needs treating through a small puncture area under ultrasound navigation. Once in position, the fibre emits radiation that is converted into heat, sealing the vein without damaging surrounding tissues. Compared to older versions, this new generation of optical fibres make it possible to use significantly lower doses of energy, minimising even further the risk of side-effects and guaranteeing a shorter recovery time. 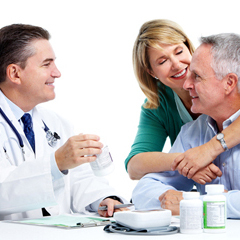 The advantages of EVLT are minimal pain and scarring, and a short post-surgical convalescence. Carried out under local anaesthetic, the procedure typically takes 30-90 minutes and patients are free to walk out of the clinic anytime from two hours post-operatively. Thread and spider veins are not just unsightly, they are also the first sign of chronic vein disease and are best dealt with before they develop any further. Easily accessible from the UK, Blumental Clinic in Bratislava, Slovakia offers expert treatment of varicose veins and related conditions at fair and affordable prices. Set along the Danube River and with a unique history and rich cultural life, Bratislava has become a popular city-break destination, making it an ideal choice for those seeking to combine varicose vein treatment with a short holiday. Blumental Clinic in Bratislava, Slovakia is a specialist varicose veins clinic offering the latest walk-in, walk-out procedures to treat varicose veins, thread veins and spider veins, including Endovenous Laser Treatment (EVLA) and CRYOLASER QUANTA Light C. Easily accessible from the UK, the clinic provides the perfect opportunity to combine affordable, expert veins treatment with a city break in Slovakia's vibrant capital city. Find out about other people's experiences of the Blumental Clinic. Blumental Clinic is rated 4.90 out of 5 from a total of 2 reviews .